Maxi Skin H&N Support™ is a comprehensive formula. It is a combination of vitamin A, hyaluronic acid, MSM, biotin, zinc, aloe vera, silica, and lactobacillus acidophilus. Hyamax™ is a standardized natural sodium hyaluronic acid. Hyaluronic acid and collagen support the skin’s layers and structure. It is the collagen that gives the skin its firmness but it is the Hyaluronic acid that nourishes and hydrates a collagen. The sulfur normally provided to the body by MSM supports healthy collagen and keratin, which are essential for healthy hair, skin and nails. The aloe vera plant is famous for its use in health and beauty products, it supports collagen. Zinc is an important nutrient for bones and nails. Silica is concentrated in all connective tissue including nails, hair, and skin. Vitamin A supports the growth of strong hair. Lactobacillus acidophilus is added to our formula to help protect the balance of healthy bacteria in the gut, which benefits the distribution of timely nutrition to the skin, nail, and hair. Try Maxi Skin H & N™. Take Two (2) Maxicaps™ daily preferably at meal times, or as directed. Other Ingredients: Rice flour, vegetable cellulose, magnesium stearate, Enzymax® (calcium carbonate, bromelain, papain, lipase, amylase, protease, silica). • This product contains no animal products, soy, wheat, gluten, yeast, sugar, salt, milk, artificial preservatives, flavors or colors. • CaroCare® is a registered trademark of DSM, Holland. • Enzymax®, a vital digestive enzyme complex, is a registered trademark of Maxi Health Research® LLC. • HyaMax™ is a trademark of Fenchem Enterprises. • OptiMSM® is a registered trademark of Bergstrom Nutrition. • TRAACS® is a registered trademark of Albion Laboratories, Inc.
A few months ago we noticed that I had a bald spot on my head. Mother took me to the doctor who wanted to administer a cortizone injection. 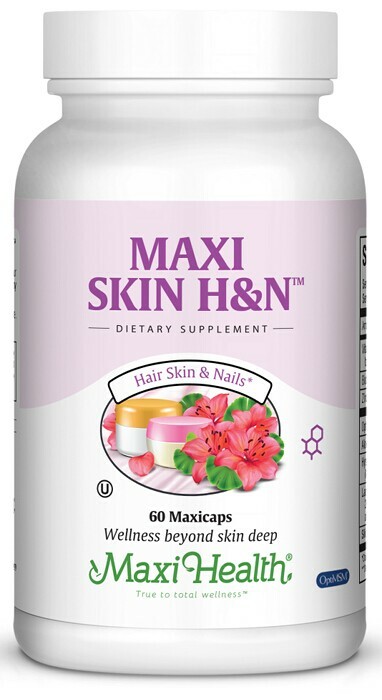 The health food store recommended Maxi Skin H&N. My hair looks better and there is no sign of the bald spot. Thank you for this wonder product. It really works!